Boasting 3600 lumens and 6 CREE® LEDs at 6000k, the Pro 3600 Enduro offers 4 brightness settings and a daylight flash mode that are factory-tuned to optimize riding in any condition. 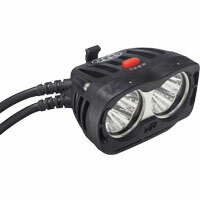 Paired with a long-lasting 8-cell battery that doubles as a USB portable charger, it makes this lighting system perfect for long night rides, high speed MTB descents or backcountry touring. Light housing is highly durable with Dupont® Fiberglass reinforced nylon. The system includes: an LED headlamp with remote switch; Li-ion battery/USB portable charger; a handlebar mount and fits up to 35mm; AC adapter and a nylon storage pouch. It weighs just 839g and is backed by NiteRider’s lifetime warranty that covers any defects in material and workmanship, mechanical components (housings, covers, mounts and fasteners) and LEDs. Converse, now part of Nike, has unveiled its new limited edition collection of annual Pride sneakers honoring LGBTQ Pride. 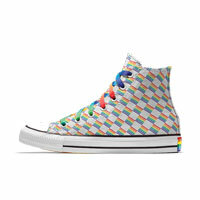 “Through this collection, Converse says YES TO ALL, standing with the belief that whatever your gender, sexual orientation, or identity, everyone is free to be who they are,” according to a company press statement. 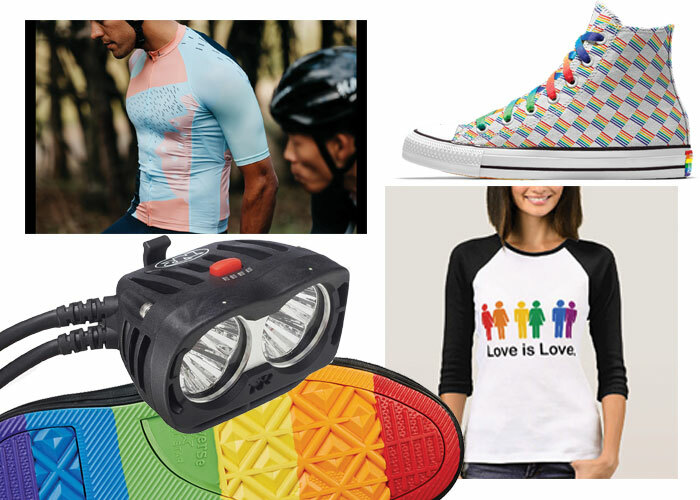 All net proceeds from the 2017 Converse Pride Collection will support LGBTQ youth organizations. Pick Your Colors: be as bold as you want to be with your choice of colors. It’s All in the Details: decide between a variety of laces, eyelets, patches, rubber sidewalls and exclusive prints to add a special twist to your design. Make It Yours: Add your name, number or an inspirational message with a personal ID. The shoe is listed on the website at $85; it’s custom-made and ships to you free in less than three weeks. Free shipping and free returns for Nike+ members. This men’s Rocky Road cycling jersey is part of Lumiere’s Sweet Collection and features a pastel blue base with navy, cream and pink patterning. Made in Australia of top end MITI fabrics, it uses Lumiere’s signature cut that looks amazing and feels like pure luxury on the bike. It is a true pro fit with high stretch and is designed to be worn against the skin. 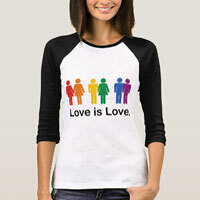 It comes in sizes XS, S and M; if you are between sizes, size down. Also comes in women’s sizes 2XS and XS. Key features include: high-wicking Italian MITI fabrics; signature Lumiere race cut intended to be worn slim; longer sleeve length; dropped collar; micro mesh back and side panels for enhanced breathability; reversed YKK zip with camlock puller and UPF 50+ sun protection factor. This Bella+Canvas classic baseball jersey T-shirt is cute, comfortable and has been cut just for women. Made from 100 percent super-soft ring-spun cotton by Bella, it includes side-seams and double-needle stitched sleeve and bottom hems for lasting quality. Select a design from our marketplace or customize this one to make it your own! Sizes go from adult S-XL; 2X is available for additional $5; shirt runs small – order 1 to 2 sizes larger than normal; side seamed construction for a better fit; machine wash warm, non-chlorine bleach, tumble dry low. Colors are white/black; baby blue/navy; white/ green; white/pink; white/red and white/true royal. Athleisure Makeup For Men: Hit Or Miss?